The relationship between Spinazzè and cyicling has always been very profound. This sport is intimately connected to the territory it crosses and has its own peculiar way of telling the story of it. 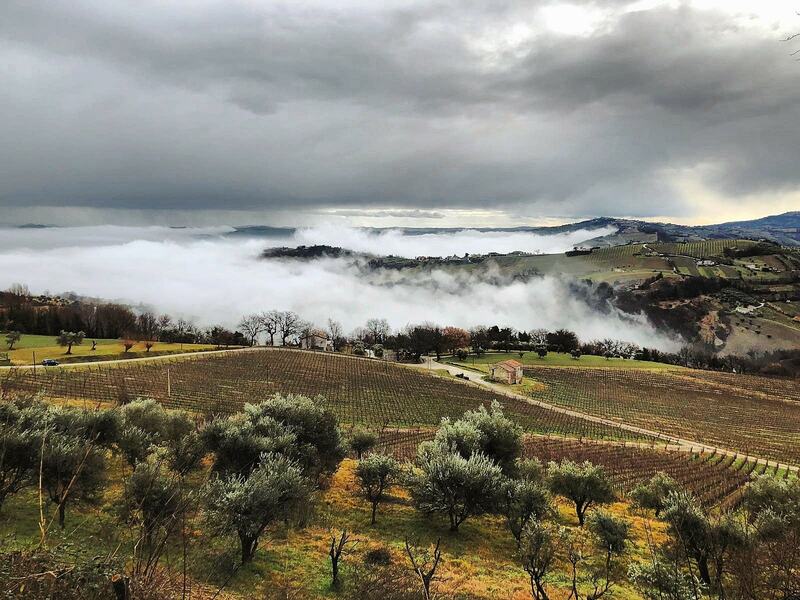 Here is how the Tirreno-Adriatico 2019 has told the story of ‘La Boccolina’ farm estate in the Le Marche region. Tirreno-Adriatico is a cycling stage race between the two seas, a journey through the beauty of Italy’s hinterland in a shining spring light that leads to the discovery of hamlets and little gems of an ancient territory, On Monday 18th March 2019, the caravan stopped at Castelli di Jesi, an historical area where Verdicchio D.O.P. is produced. Verdicchio is a wine varietal that has its best expression right on these gentle hill-slopes. And it is right in this area of Le Marche region that Terre di Ger has its own estate named “La Boccolina” where olive oil and wine are produced – supported, of course, by our poles. Federico Capogrossi speaks about the Spinazzè equipment installed in the vineyards: In la Boccolina farm we only install weathering steel poles and coloured concrete poles as head-posts. 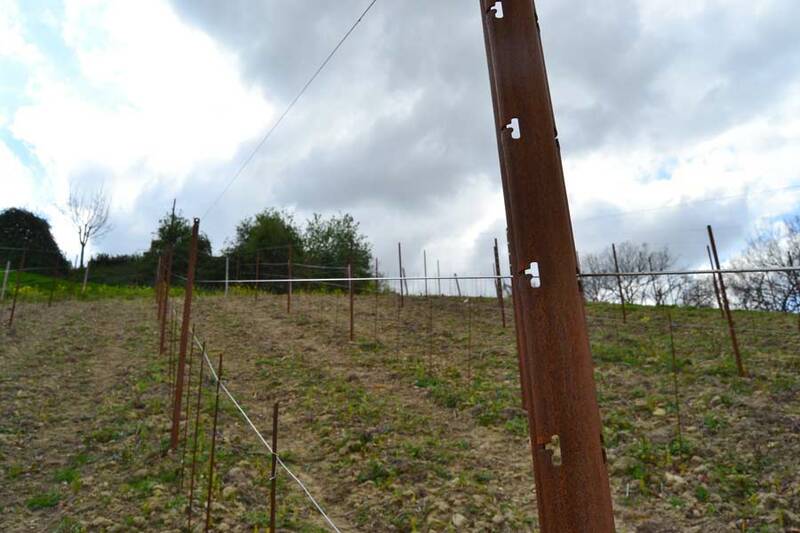 In a few vineyards we will use weathering steel poles as head-post chestnut wooden poles depending on the length of the rows. 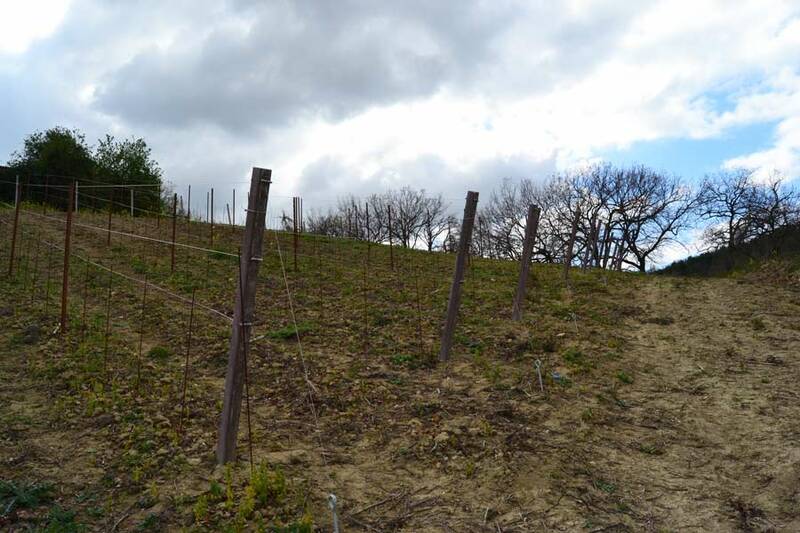 It is important for us to have a large set of solutions for our installations in order to suggest them to our farmer clients that are now looking for poles and accessories for their vineyards. Weathering steel is not well known in the Marche region yet, but there is a lot of interest, especially for the low environmental impact and the mechanical resistanceIl of the larger poles. Weathering steel (cor-ten) is highly resistant to corrosion and we use a type of steel that is at the top of steel classification charts, known as s300jow. 1,90 mm and 2,00 mm thickness guarantee high resistance to twisting and bending, they are able to maintain great flexibility and guarantee long endurance without losing their characteristics. Workmen are along the rows and Mr Capogrossi explains: We are now installing 3×1 m vineyards of Verdicchio. We are going to plant seven hectares, four among them with Montepulciano grapes and almost three hectares of Pinot Grigio. In the higher hills we will plant Montepulciano as well – around 380 m a.s.l – and Pinot Grigio on an intermediate height, all of them will be cultivated according to organic farming. Recently we have replaced older wooden posts that were broken at neck level with weathering steel poles and I have to say that the result looks great. The air is freezing, dark clouds have been carried on, and yet the sun is sending a surreal light on the hills. 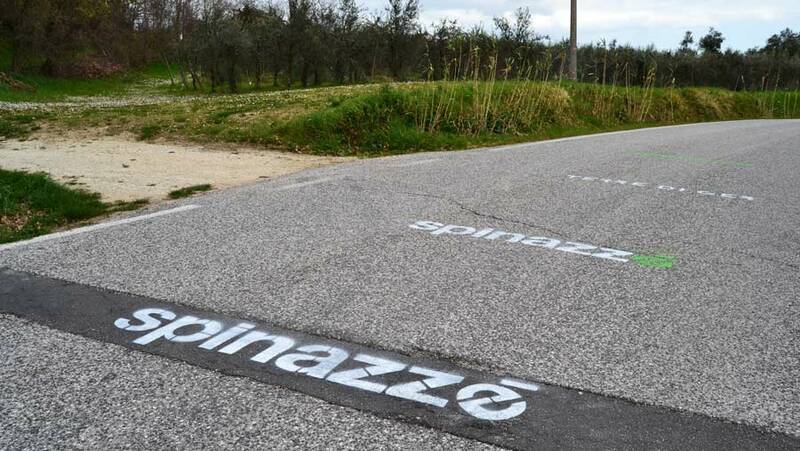 It has been said that it is going to rain on the finish line and the wind keeps on shaking the trees along this small curve right out of Maiolati Spontini: the road up here, the vineyards down there, still as ancient watchmen that know everything about this land. 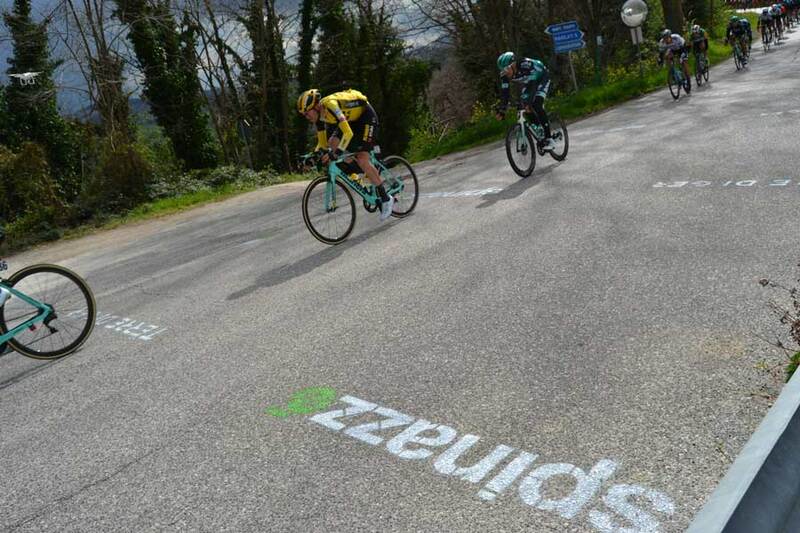 Slogans are written on the asphalt, because this sport is just like that: it owes everything to the street and to the people that is waiting for a lift at every corner. All in all it is just a fraction of a moment, a fistful of confetti, but the waiting is the only constant. We hear the helicopter: they are close, but they can be anywhere. There is a lot of echo between the hills and the houses that are almost empty, because everyone is standing still and silent watching the cars passing. The runaways come forward, then minutes pass slowly, as if we had to win back time. The peloton arrives like thunder against the hailstorm. Dark clouds are gathering around Jesi. It is a matter of a moment, for sure, but that single moment has made us spend hours and kilometres. All this instinctively bring us back to the patience and passion of working the land, because the two things are somehow connected to each other, as always. A sport of hardship and endurance that tells something about our lives even just by a short race.